Find quick answers to your queries. Can I Import mails to Office 365? How to perform EDB to Office 365 Migration? How to test the Impersonation rights and connectivity using the Microsoft Remote Connectivity Analyzer? Standard folders (such as Inbox, Calendar, Contact etc.,) on my EDB mailboxes are initialized with different language. How do I migrate these folders by mapping the respective system folders on target (destination) server? How to set Impersonation Rights for EDB to Office 365 user account? I'm trying to Login Office 365 using EdbMails for EDB to Office 365 Migration, it is failing. Why? How do I map source and target mailboxes / user accounts during EDB to Office 365 migration? Why am I getting a '407 proxy authentication required' while connecting to Office 365? Can I use Office 365 user account which is not an Office 365 exchange mailbox account for EDB to Office365 migration? Do I need to set Impersonation Rights to each and every user account? if I select more than one mailbox from the EDB file at a time, is it possible to map to different target mailboxes? Yes. Using EdbMails you can import mails to your Office 365. Click here to open the Microsoft Remote Connectivity Analyzer webpage. Upon opening Microsoft Remote Connectivity Analyzer webpage, under 'Office 365' tab, test the connectivity for "Exchange ActiveSync Autodiscover". Connection must be successful to proceed with the next step. For Instance: Your source Inbox folder is named 'Boîte de réception', which is in French language. If you migrate this folder directly to the destination server then by default it will not get mapped to the 'Inbox' folder on target server. In order to map this to the respective folder, change the regional settings on Office 365 target server to that of your source mailbox folder language (in this case, it is French). How to set Impersonation Rights for Office 365 user account? Ensure that you have set "Impersonation rights" for this user account. Click here to know steps to setup Impersonation. 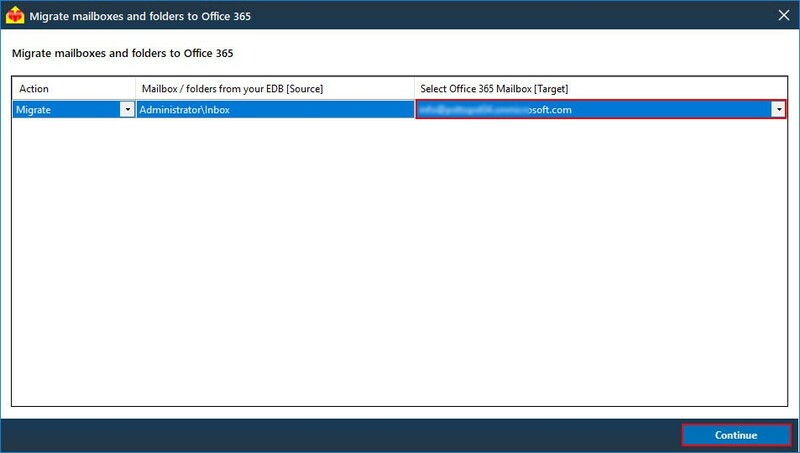 EdbMails allows you to select appropriate source and target mailboxes during EDB to Office 365 migration. For this, select the mailbox / user account in the list of mailbox / folders there are selected for EDB to Office 365 migration as shown in the below screen. This problem occurs when there is something wrong with your environment network configuration, most likely DNS settings. Can I use Office 365 user account which is not an Office 365 exchange mailbox account for EDB to Office 365 migration? No. To perform EDB to Office 365 migration, the Office 365 account that you are Impersonating must be Office 365 Exchange Mailbox user account. No. You no need to set Impersonation rights to all the Office 365 Exchange mailbox accounts. You need to set Impersonation rights to only the Administrator user and use this Administrator user for Office 365 login via the EdbMails application during EDB to Office 365 migration. Using this Impersonated user, EdbMails will list all the other users and you can map them to any Mailboxes for EDB To Office 365 migration. YES. You can select and export multiple mailboxes at a time and map them to the desired user accounts in your Office 365.